To pour out the artistic feelings of their heart, our diligent designers have chosen these metal handicrafts as matchless vehicle. Striking designs filled with eye pleasing colors in cheerful combination are the true evident of it. We promise that people, who are in quest of something creative will be surely satisfied with this collection. We design various wrought iron accessories such as wrought iron wine rack, wrought iron magazine rack, metal wine racks, wrought iron wine bottle holder, metal wine racks, wrought iron door handles, wrought iron decorative handles, wrought iron designer handles, wrought iron kitchen handles, wrought iron bathroom handles, wrought iron cupboard handles, wrought iron fruit holder, metal fruit bowl, metal wash basin, metal bathroom sink, copper bathroom sink etc. 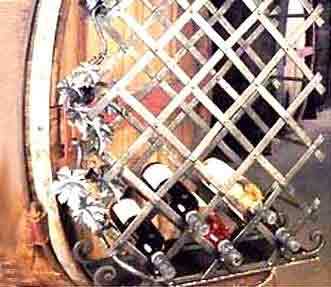 Description : Wrought iron wine racks, which feature double wall of lattice pattern to hold the wine bottles in lying position. Must for every contemporary bar.